Two-time defending NBA champions Miami Heat are going “back to the basics” during the training camp this week being held in The Bahamas. The camp runs from October 1-4 at Atlantis Paradise Island. It is only the second time in star player Dwyane Wade’s recollection that the Heat has left Miami for training camp. It’s a trip that the team and tourism officials had planned for some time, says coach Erik Spoelstra. “We think this is a very good environment for us to get to work, getaway and get back to building some habits that we’ll need,” he said during a press conference held yesterday. The Atlantis resort’s Imperial Grand Ballroom has been transformed into a professional basketball court for the camp. “Anything that goes to promoting The Bahamas and Atlantis we are happy to be a part of,” added Ed Fields, senior vice president of public affairs at the resort. Atlantis first hosted basketball events a few years ago when the resort launched Battle 4 Atlantis, a preseason men’s college basketball tournament that takes place in late November. Odyssey Aviation brought the Heat to The Bahamas Monday night and the team was treated to a Bahamian junkanoo welcome, before being driven in a motorcade to Paradise Island. “We know we have fans everywhere… but to have another country show us appreciation like that is very important to us,” Chris Bosh told the local and international media Tuesday after players wrapped up an early morning training session. The first day of training camp focused on getting players in motion and started around 9 am. In the afternoon players carried out offensive work. Although the training camp has been called a “mental reward” players are expected to not only work hard, but also to bond. “It’s training camp. 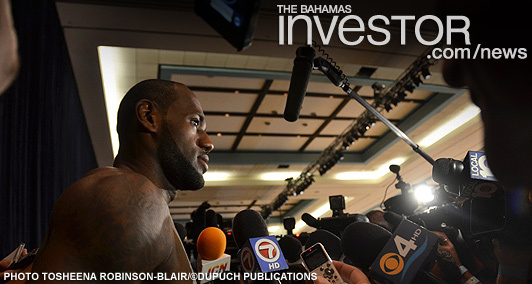 It just happens to be in The Bahamas,” said center Greg Oden, a newcomer to the Miami Heat. The Bahamas trip presents an opportunity for the ball players to “clear our minds,” as Wade puts it. “We get to have us time. We don’t have that as much as we would like, so this is great from that standpoint… to get down here and get back to the basics before we get back into that real world,” he told reporters.